Tickets: Limited $20 advance here. Description: Mixed dnb & dubstep night compression style. 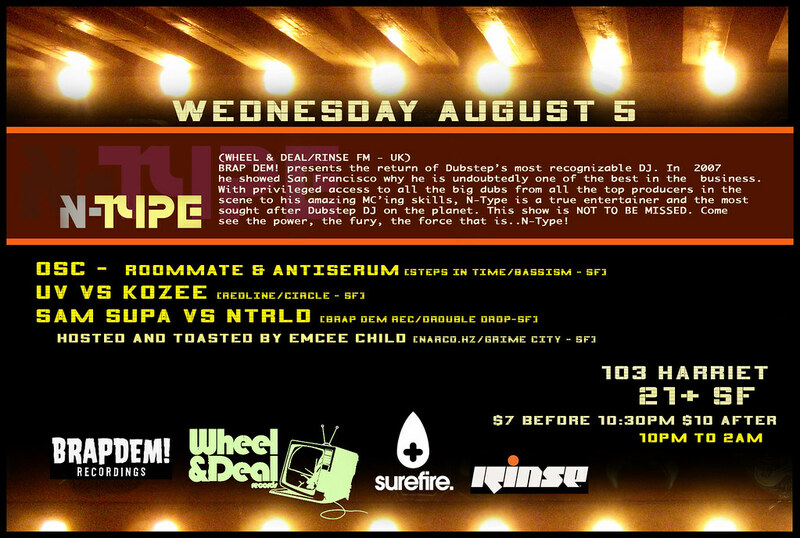 While it says Antiserum on the flyer it\’s DZ in his place. Big one! Description: Rusko brings a live combo of bass guitar and dubstep which gets the crowd moving everytime. Datsik comes with his patented ultrafilthy version of dubstep. Local support on the dubstep/glitch boundary. Description: Lineup on this show is out of this world. Welcome back from burning man, but I’m afraid the burning will continue on the dancefloor. First SF appearances from both Akira Kiteshi and Gemmy. Description: Can’t recommend this one enough. N-type is one of the most influential DJs in dubstep and a killer producer also. Plus a weeknight at 103 means a dedicated crowd. Tickets: $7 before 10:30, $10 after.